When I signed up for the Design Council’s ‘Transforming Aging’ workshop I was really impressed from the first email that I was sent as to how professional and well organized the entire experience was. With visual and informative slides on Design Academy and what it stood for, a brief on each group and the kind of topic we would be working on; I knew it was going to be something that would make Wednesdays worthwhile. The Design Council workshop was held over a month spanning four Wednesdays (from 17th January to 7th February 2018). ‘Service Design’ and ‘Design thinking’ have been terms that have gained a lot of traction in corporates and non corporates over the years. As the concept of design moved from aesthetic to function, centering more around human needs a number of design bodies have begun to really explore and create work based on design research, qualitative data and system and product based solutions. Design Council is one such company that is largely know in the United Kingdom for their stretch of work in this sphere. The first day was about familiarizing ourselves with Design Council and associations with value, product and design. We looked at possible definitions of design and how it has evolved over a period of time. Over the period of the day we were asked to get familiar with our respective group challenges by using the Opportunity Tool and Stakeholder Map. The engagement with these tools enabled us to realize we were inherently informed of our topics and had a certain degree of basic understanding. 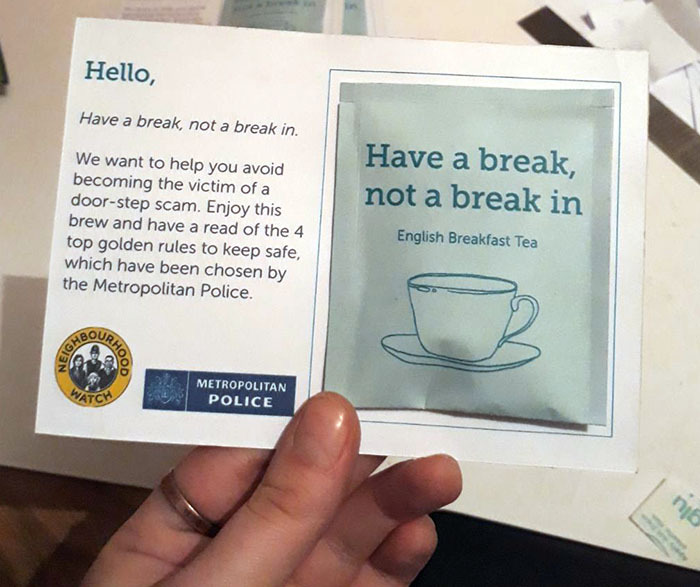 The topic we were given was ‘Tackling Fear of Crime and preventing door step scams.’ It was fairly challenging as the topic covered such large ground. 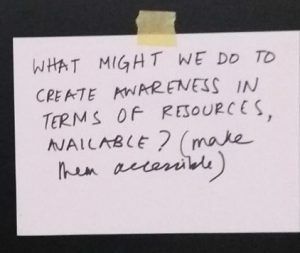 We tried to build an ‘ecology’ of the ‘problem area’ and our facilitator Daniel Letts took us through design research methods like Interviews, Alternative Mapping, Journey Mapping and documentation through journals. We discussed our individual understanding of what the stakeholder ecosystem was like which also acted like an ice breaker for the group. Our personalities and our respective design backgrounds ranging from Graphic Branding and Identity, Service Design to Illustration, Interaction Design and Design Management brought a varied set of opinions and skills to the table. The classroom was set up in such a way facilitate feedback where after every exercise we were required to discuss our insights from the particular tool which created an active feedback loop. The learning approach and curve was swift, enriching and motivated at every level. The next week we a really interesting session with Revealing Reality where we had one of their researchers come and talk to us about the importance of generating insights and how that can really determine the impact of the solutions of any particular design research question. This session gave us a break through in terms of direction as he asked us to look at the perceived fear of crime as opposed to the reality of ‘crime’ itself. What are the triggers? What causes it? 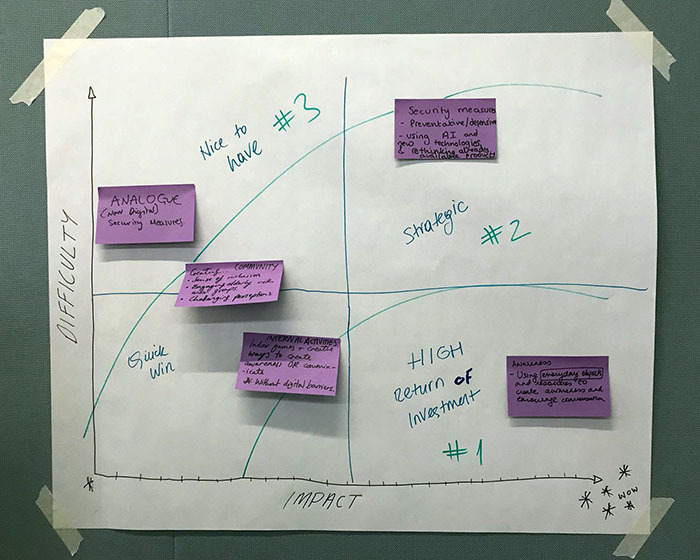 It helped us map about our project canvas (another service design tool that broke down the different project aspects) and narrow down to what factors like – what kind of target audience were we looking at? Could we focus on one ‘section’ or group of the elderly, those whose movements were restricted and they were often confined to the space within their homes (extreme users)? 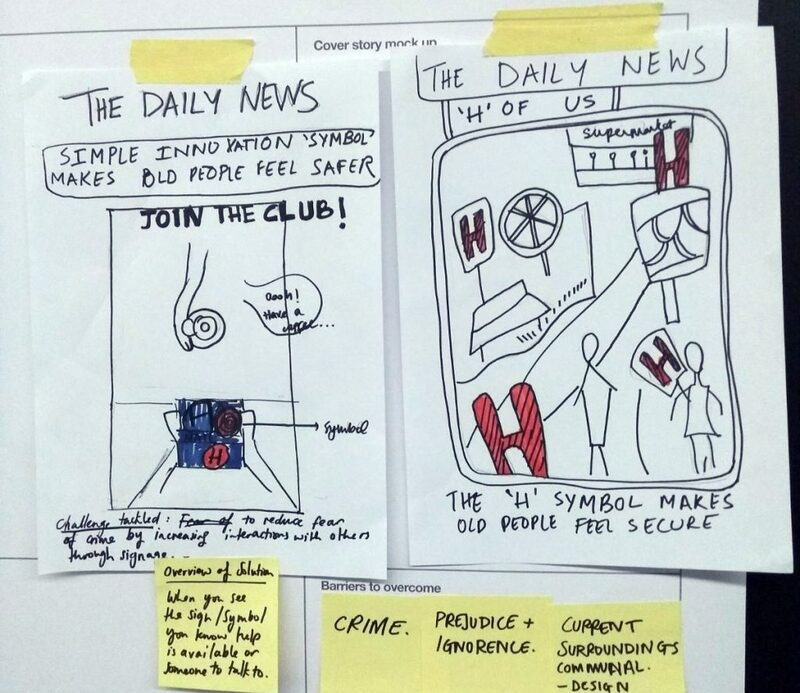 By the end of the second day we had formed a more holistic picture of our team projects through the ‘How Might we’ questions (recommended by the Harvard Business Review), a front page newspaper mockup of what the possible solution could look like. These were all tools to enable us to populate our project canvas and move forward speculatively to the ideation stage of the project. Daniel also placed emphasis on us understanding the importance of design research and how it was different from ‘classic’ or ‘market’ design research. There is always a need for both while developing product for a consumer group, Design research was more qualitative in nature, could be micro/macro and subjective to the user. Classic or market research, which comprises statistics and quantitative analysis of generic user groups is something that can be applied after insight generation and application of design research methods. The third and final day of the teaching and interaction bit of the workshop comprised further reframing and contextualization of our challenges. We explored the colorful rose- bud-thorn method we clustered our insights into strength(pink), weakness(blue) and opportunity post its. These helped to form a roadway into the big ideas or solution areas we could possibly address. The tools we used in the session that followed was brainstorming and the difficulty matrix. Our ideas, insights and understanding of the project seemed to elevate with the help of these tools and by the end of the third day we had managed to successfully get a descriptive idea of multiple touch points that we wanted our service to access, frequently used by our target audience group. Our presentation at the end was a definitive process and how we arrived at the product. We also showed a conceptual cycle of the various touch points the service intended to cover and a service blueprint of the service- covering the various stages of the B2B idea including tie ups, packaging, distribution and final outcome. 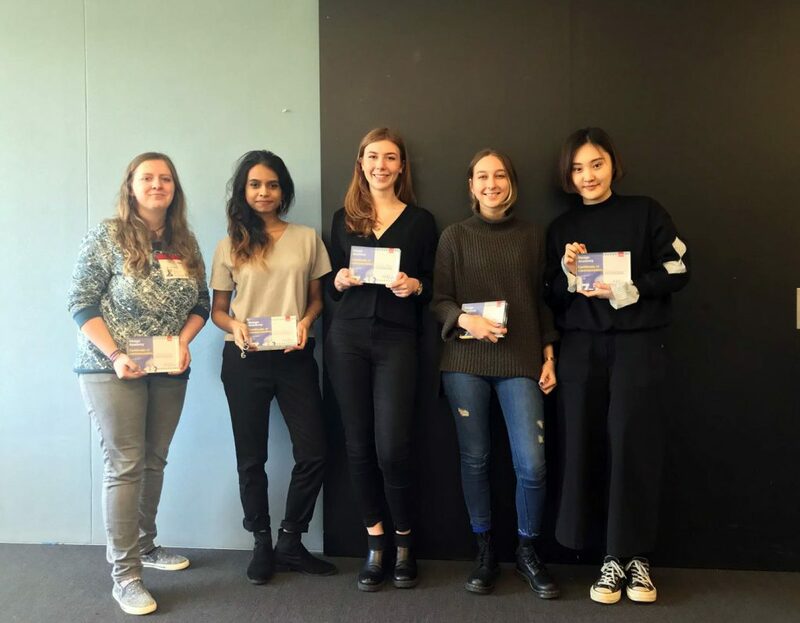 Winning a commendation out of the 6 teams for our efforts was a cherry on the cake but the entire experience with Design Council was one of the best learning stints while doing my masters in UAL. It also gave me a taste of successful collaboration and how there was always a chance of creating something greater in a team when a set of dedicated individuals put their heads together.